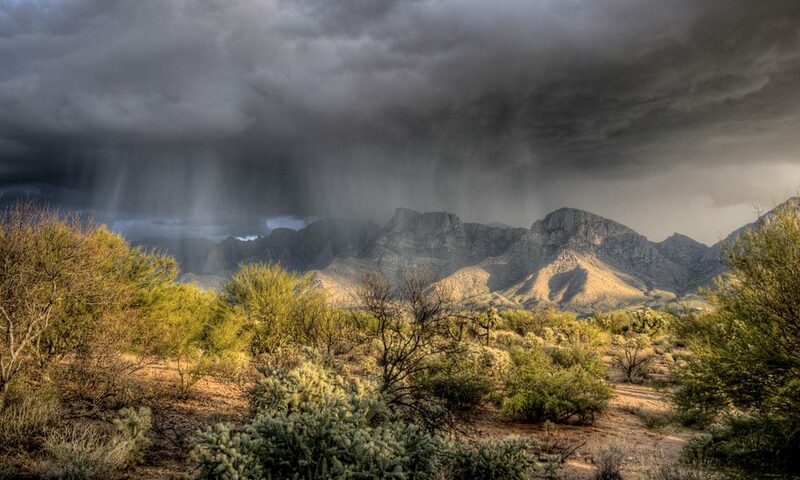 The Southwest of the United States experiences a unique season called the monsoon season. Monsoons are usually associated with the tropics as cool ocean air rises when it hits the warmer currents over land. This forms clouds that can drop heavy rains for a long time. The US states of Arizona, New Mexico, and parts of Utah and Colorado get the periphery of the Mexico monsoons. And when heavy rains fall suddenly on dry desert ground flash flooding often occurs. But why are flash floods so dangerous? Well, let’s find out. I know how to swim, so what’s the big deal? To the inexperienced and unaware, the problem of flash flooding may seem easily solved with a skill many of us learned when we were children. I lived and worked for several years in an area that was both prone to flash flooding and heavily frequented by tourists. Potential flood areas are often closed off, which of course bothers people who have come from other states or countries to hike and backpack in those areas. I’ve even had people say to me, “I’m a strong swimmer, so I’d be willing to risk it.” But the problem is not the depth of the water, my friends. Check out the video below to understand what I mean. Flooding, in general, is responsible for more deaths around the world than any other natural disaster. 1 And it’s no wonder, with the speed and power displayed by a flash flood. The flood in the video above is quite slow moving when compared to some floods. Flash floods have been known to raise the water level by 12 feet or more in a period of minutes or even seconds. They can push thousands of tons of debris, including whole trees. And they can be further complicated by the topography of an area. The Southwest contains numberless examples of one of my favorite topographical features, the slot canyon. I love slot canyons. They’re beautiful, interesting, and sometimes a challenge to navigate through which I heartily enjoy. 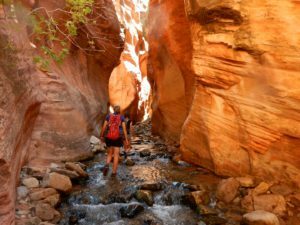 But, imagine a flash flood and instead of standing safely above the floodplain on a ridge, like I was in the video above, you’re deep in a slot canyon. Slot canyons are often sheer cliffs on both sides. During a flood, you could be trapped with no way to reach the high ground. Be aware of the weather! The monsoons happen in the American Southwest in July-August but this is not the only time a flash flood can occur. Any period of sudden heavy rainfall, onto dry soils, can result in a flood. If you are planning a backcountry hike in canyon country, check the weather, check the weather again, and then check the weather right before you lose cell service. Use a reliable weather app, not just your default phone app. It is very beneficial to use a weather app equipped with a radar forecast. My favorite weather app is called Storm Radar. I have found it to be very reliable, and the radar is always extremely accurate. Pay attention to any special weather alerts, warnings or closures issued by the authorities of the area such as the National Park Service. You can get daily flash flood information for the Southern Utah area from the National Weather Forecast here. Understand the way the watershed drains. Flash floods can be caused by storms miles up canyon that are undetectable to you. In 1997 a cloudburst 15 miles away sent a flood into Antelope canyon killing 12. 2 And in 2015 flooding from 7.5 miles away killed 12 near the Utah Arizona border. 3 These are by no means isolated incidents. Know the weather forecast for areas that will drain into your adventure location! If you are unsure, or you can’t find out, it’s better not to risk it. Make sure that someone knows where you will be going, your expected route and when they should expect you back. This is a good habit to make in any backcountry situation. If you don’t want to go through the safety precautions, just stay away from canyon country during the monsoons! Don’t be caught unawares, don’t become a statistic. Once you’ve checked the weather, are comfortable with the forecast, and are headed out on your adventure. Be aware of the topography as you hike. Take note of possible escape routes you could use should the need arise. Notice anywhere you might be able to get to high ground. Keep your eyes open for any signs of a flash flood coming your way. Rumbling, sudden water in a dry area, changes in color, speed, and debris floating in the creek you might be walking in, etc. These signs tell you to get to the high ground you noticed earlier. Armed with your newfound knowledge of the dangers of flash floods, you now have the ability to make smart decisions about your hiking and backpacking trip locations. Plan to have a safe trip and the fun will automatically follow! I hope you will remember this article and keep yourself safe out there. If you have any questions, comments or concerns, please leave them below. Thank you for the excellent advice on flash flooding. Here in Florida, we don’t experience a lot of flash flooding but my son and I do plan to travel to the Grand Canyon area in the near future and we love to hike. We’ll definitely keep an eye on the weather and be aware of our surroundings. It absolutely helps to know what to look for and expect before going somewhere. Thanks! Thanks for reading! The Grand Canyon is gorgeous. Happy hiking and stay safe! I must be crazy. I keep coming back to this flash flood video. Let us be reminded that it can always be us that end up in a catastrophic YouTube video! Always check the weather, folks! You’re not crazy! It’s mezmerizing, even more so in person. I took that video from the side of the road going up Cedar Mountain and I kept getting back in my car, driving further down the mountain and watching the flood come in again. I probably did that about 5 times. Wow! Your video of a flash flood is really scary. It is obvious that anyone caught in the path of it would not have a chance to get out of the way in time. I have seen a river in full flood, but that does not compare in danger to the flash flood you show. I don’t live in a part of the world which generally experiences flash floods, although they have been known in the UK, for instance when a river in full flood suddenly changes its course and floods a whole village, but as I said, they are very rare, but who knows what will happen in the future if climate change continues on the course it is now? Is there anything at all that a person can do if they are not able to get out of the way? Your advice is so valuable to anyone contemplating exploring areas which are prone to flash floods, you could well be saving lives here. If you get caught in the debris, there is not a whole lot you can do. But people have survived so there’s no guarantee that you won’t make it out. Deputy Paul Clifton with the Coconino County Sheriff’s Office says that if you are caught in a flood, don’t panic! Point your feet downstream to use as a barrier between you and floating objects. Also use your feet to try to feel for shollower spots. Try to move toward a slower current or beach where you will be more likely to be able to get out or be rescued. I got caught in a flash flood quite a few years ago, had to climb a tree and wait it out. I wasn’t in canyon country though, I had ventured down from the canyon to avoid the rains and the wall of water followed me into the plains. You are right it wasn’t incredibly deep water (maybe half a metre) but there was a lot of it with a lot of deadly debris. Could have been a right disaster if I tried something different. So glad there was a tree for you you to get to a high place and the flood wasn’t any bigger. I’m sure you can imagine how a big flood pushing tons of debris like the one in the video could simply knock your tree over and you’d be trapped in the flood. So glad you are safe, my friend. I must say that this article is very helpful l but also very interesting. My opinion is that most people are not afraid of water and they don’t know how water can be dangerous especially flash floods. What I saw in the video is really fantastic and unbelievable. Let God keep us safe. Thanks for checking out my article! Hey there! How are you doing? I really enjoyed reading this blog post on why flash floods are so dangerous. It contains lots of valuable information. I’ve experienced a flash flood while going on a vacation to Arizona. Me and my friends set out to see the grand canyon but we recorded some rare footage of a flash flood. Even swimming cannot save you from flash floods because there are high chances that you will be hit by debris. Hi, I’m doing great. I would love to see the video you recorded. Is there a link to it? Flooding is a really terrible disaster and I think it is far more than fire because you can actually put out fire but once there is flooding there is nothing that can be done about it. Flash flooding is extremely dangerous and it should be avoided. With the death toll rising due to flash flooding it’s no wonder the awareness is becoming more of recent. Flooding sure can be devastating. In the case of flash floods, if you are properly aware of the weather and your surroundings, chances are you can avoid getting caught in one. This is great information, I have been on hiking vacations a couple of times with family and I never even considered worrying about flash floods, even though you see the impacts of them on the news all the time. It just fell into that it can’t happen to me category I think. Thanks for making me more aware of the dangers and precautions I need to take moving forward. Thanks for reading! Just be aware of the weather and your surroundings and you can continue to have fun and much safer hiking adventures. This is definitely the kinds of stuff you need to be aware of in any place that’s considered a flood risk. I live in South Florida and being prepared for flooding here is must, especially during hurricane season. Too many people underestimate just how fast the currents from flood waters can get. If you get caught up in that water, then even your ability to swim isn’t going to do much to protect you from slamming into stationary objects at incredible speeds or being electrocuted by a downed power line. A little preparation and awareness of your surroundings can go a long way in keeping you and your family safe. Yes! Though my article is primarily focused on the risks of flooding in the backcountry there are certainly a whole other set of risks associated with flooding within cities, as well. Preparation and awareness are essential in both situations. Thank you for all the information. I personally do not read many articles like this. I believe that this kind of information is very important, must be known. It is like with any other activity, sky diving, going to the beach, driving a car, with all of these we need to be cautious. Can you tell me what not to do when your are in the middle of a flash flood? Hi Fredery! Do you mean if you are actually caught in the flood waters? If so check out my reply to Chrissie Spurgeon above. She asked the same question! This is a great article. Safety and education has to come first no matter what. I have first hand experience of getting caught in some quick flooding. We were hiking along the river, We finally bunked down about 25 feet from the water. By morning when we stepped out of the tent the water was less than 12 inches from the tent. There was no way we were getting back the way we got there. However what saved us was that before we left we knew that some of the spring thaw could be hitting us so we made sure we had a plan B on getting out. So it was education and being prepared that saved us. Glad you were prepared Dale! Thanks for reading my article and giving us another first hand account. I found this article very interesting! I like how you added the video in to stress the immense power of a flash flood. I think people tend to forget all of the debris. I have never been in one (thank God) but I have to say that I admire the clouds immensely. I live in Southern California so we get to see the light show within the monsoon clouds east of us,with all of the lightning and such in July and August. Sometimes we are even fortunate enough to get a bit of rain from these systems from time to time which result in flash floods in the desert. My question would be, as a rule of thumb, should you seek shelter on higher ground when it starts to rain hard? And if so, could you give a suggestion on where the best place would be? I would probably go near trees, which have a greater chance of being hit by lightening. Would it be a better idea to stay near rocks rather than trees? Thank you! In the case of a flash flood you generally won’t be in the storm itself. The storms that cause flash flooding often happen miles upland and send the flood down into the valley or canyon. 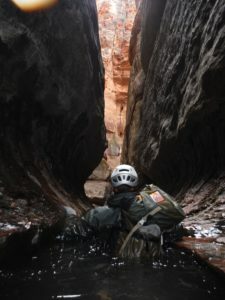 However, if you do happen to be in a slot canyon or wash and it starts raining hard, I would 100% suggest getting out of there and to higher ground. But as I said in the article, more likely your warning signs of an impending flood will be an increase or change in the flow of water around you. Without regard to flooding, and as far as actually being caught in a rainstorm goes, if there is no thunder or lightning you should be fine to keep hiking if you would like, or seek shelter from the rain. Not all rainstorms mean thunder and lightning. But as soon as you hear thunder, your best bet is to get back to your vehicle if you can. If that’s not an option then try to stay low. Avoid tops of hills, open fields, and tall isolated isolated trees.